My heart beat fast and my muscles pulled tight as I walked along the shoulder of Pacific Highway 1 while an endless parade of cars and the the occasional pair of cyclists rode past at high speeds. All I could think about was how long it would take me to reach my exit back to the beach, back to safety and quiet, and whether or not I could get there before getting run over by a vehicle. It was the second day of a 23.5-mile walking journey from Long Beach to Newport Beach and the first and only time I was forced to walk completely away from the ocean and waterways that flowed into it. First, my path to the beach had been blocked by the fenced off grounds of a naval station, then by a gated community of waterfront property. It was a mere 1.5 mile stretch that felt like forever. By the time I made it back to the beach, tense and hot, all I wanted to do was get as far away from the highway as possible. This meant going down to the shoreline. As soon as I could hear the waves my heart started to settle. My breaths grew longer and stronger. Listening to the waves roll in and out--the rhythm of the earth’s pulse--was exactly the medicine I needed to calm my anxiety. There’s something magic in the ocean, something calming, something magnetic. You don’t need to be an ocean swimmer or surfer to gain the benefits of that. You just need to get close and listen. I don’t consider myself a beach person. I don’t like the idea of swimming with fish and other creatures of the sea. I don’t like the way that sand instantly clings to me and my belongings. Even photos of small children covered in sand make me cringe in second-hand discomfort. Three seasons out of the year, I would choose a trip to the mountains over a trip to the beach every time. But in this instance, it was late January and my body and spirit had been longing for the unadulterated warmth of the sun for months. After a couple of other plans fell through, the beaches of southern California were my best bet for reliably sunny weather. Inspired by Tom Courtney’s book, Walkabout: Malibu to Mexico, I decided that I would walk a stretch of the Pacific coast, sleeping in a different town every night. Long Beach to Seal Beach, Seal Beach to Huntington Beach, Huntington Beach to Newport Beach. This section of the California coast is a sort of liminal space where the wild and untamed ocean meets tamed, urban and suburban beachfront communities. The residents of these communities move there to be close to nature in the same way that others might choose to move to rural Idaho, but unlike more remote areas of the country, the clash between nature and civilization is more abrupt. There is no slow transition between one and the other and so during this trip I was constantly being confronted by this contrast between what soothes me in nature and what roughs me up mentally about urban life. It wasn’t my dream trip. In fact, it was the backup plan to my backup plan. But it turned out to be filled with quiet moments of wonder and lessons about the relationship between nature and mindfulness. Mindfulness. Some people will roll their eyes at the mention of that word. A year ago I might have been one of those people. It invokes memories of failed attempts at meditation--yet another thing you have to practice in order to get “good” at. When you find that you lack the discipline or the attention-span for seated, silent mediation, you feel like you have somehow failed at relaxation. How can anyone fail at relaxation?! But according to the nonprofit, Mindful, mindfulness, at its most basic, is simply the “human ability to be fully present, aware of where we are and what we’re doing, and not overly reactive or overwhelmed by what’s going on around us.” The more disciplined among us might achieve mindfulness through a practice of meditation, but I personally think it can also be achieved in a busy restaurant when you’re sitting across from a dear friend and you mentally step back to fully savor your affection for them...or while standing on a beach listening to waves lap at the shore. Hours later on that same day of my coastal trek, I found myself engaged in a constant stream of internal grumbling. Even in southern California, 84-degrees was unseasonably warm for January. The sun was strong and relentless. Along with the high temperatures came wind and flying sand that drove me away from the cooling waters at the shoreline back to the paved, multi-use paths between the beach and the highway. On top of it all, I had failed to pack any snacks, thinking that I would inevitably pass an ice cream shop or convenience store along the way as I had the day before. In fact, I did pass several food establishments as I walked from one end of Bolsa Chica State Beach to the other, but every single one was closed. SeaLegs at the Beach? Closed. Beach City Provisions? Closed. Pacific Kitchen? Closed. My hunger rose with every dark window and shuttered door. 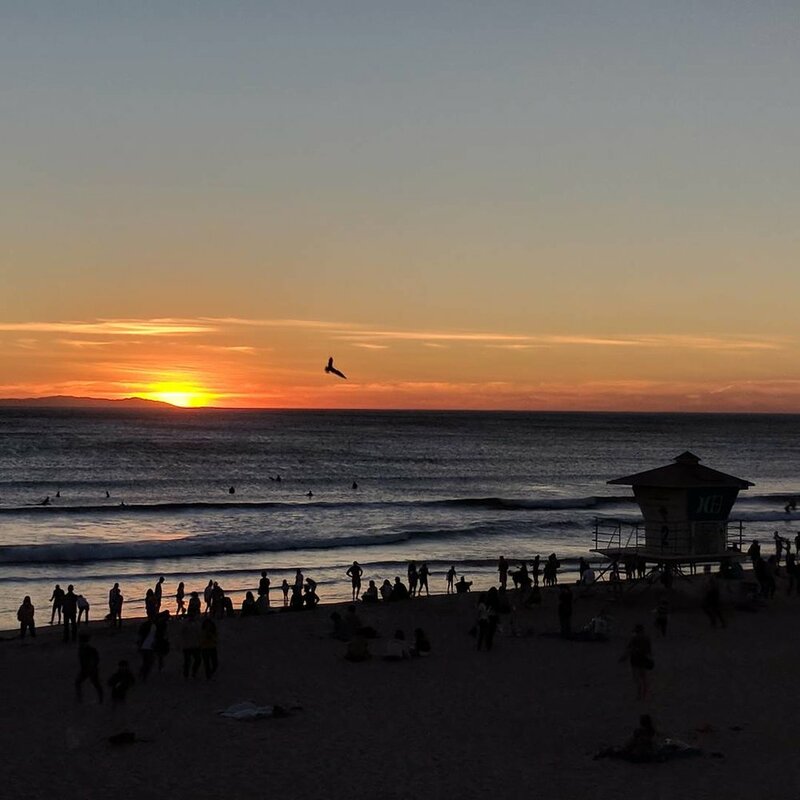 By the time I reached the edge of Huntington Beach--gratefully protected from the wind by a tall bluff--my mind was grumbling, my stomach was growling, and part of me wanted to jump off my path for the closest restaurant and call it a day. But the part of me that likes to finish what she starts won out. I decided, despite my empty stomach, to slow down, take off my hiking boots, and head to the shoreline to let the water roll over my feet and ankles for the first time that day. I redirected my attention to the sound of the water, then to the variety of seashells buried shallowly in the sand. Just as they had that morning, the waves calmed my complaining inner voice and brought me back to gratitude. I resolved to keep walking until I got to the pier. Salmon tacos and mango-vanilla soft serve would come later. On my last day of walking I woke to a beautiful, windless day and after an early outdoor breakfast on Huntington’s main street, headed for the beach. My heart swelled to see the people who were already out on their bikes and rollerblades and surfboards and their own two legs up early on a Monday morning to commune with the ocean. I’ve never had any desire to surf, but I appreciated the dedication and obvious passion of those who engaged in the sport. I shared with them the pleasure of basking in the quietest part of the day, the commitment to getting up with the sun in order to feed your own spirit because it makes All the Rest of It tolerable. I might not be an ocean person, but in this one way, I felt like these early morning beach dwellers were my people. Perhaps riding on that wave of goodwill and anonymous human connection, my legs seemed to move at their fastest pace on that last day. I reached the edge of Newport Beach before noon and with hours left to spare before my ride came to pick me up, I decided to stroll the final stretch along the surf-line. I wanted to soak up the sound of the waves for as long as I could. Almost as soon as I got to the water’s edge, I spotted two whales playing close to the shore. The surfers paddled themselves out of their path. Another lone woman on the beach seemed to be crying at the sight. We all gazed in wonder. I walked briskly along the sand trying to keep up with the whales’ pace. I had seen whales before but never by happenstance. It was one thing to go looking for whales and find them. It was quite another for them to just appear in front of you unexpected. This felt like a blessing, a reward earned for the miles walked, the attention paid, the muscles challenged, a proper send off from the ocean to me. A whale off of Newport Beach.